I have used spellings and descriptions as per the originals. In many cases this reflects ancient spellings, pronunciations and customs. In other cases manual transcriptions or digitisation have given rise to misspellings. I have not tried to correct these, rather I feel that they add to the experience of exploration and learning that this exercise engenders. Anciently called Sraid Mhaighe Breacraigh, i.e. the Street of Moybrackry. This parish occupies the north east corner of the Barony of Ardagh, bordering on Co. Westmeath and lies between the parishes of Granard and Mostrim. It contains 3,377 acres. In Street Civil Parish there are 18 townlands plus 35 in Streete Civil Parish. 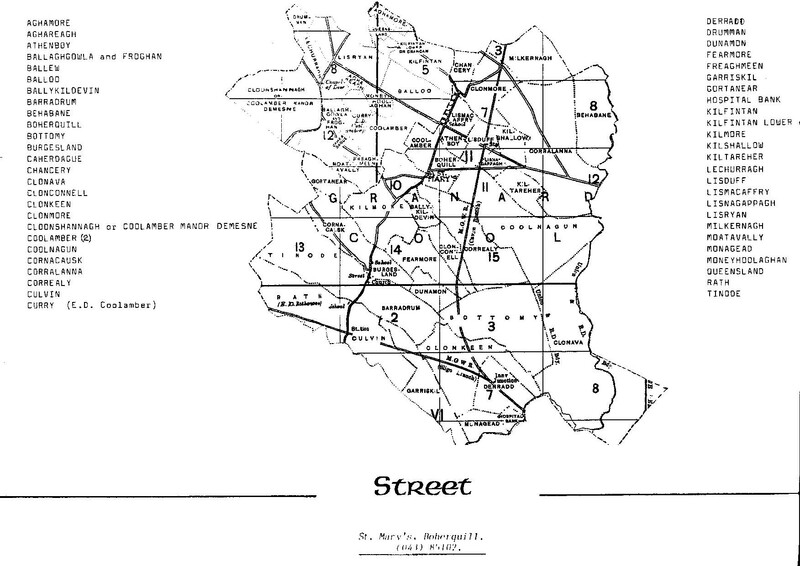 St. Mary’s Streete Roman Catholic Parish includes all 51 townlands. St. Mary’s church is in Boherquill townland. Rev. Wm. Monaghan, P.P., Street, put a stop to the Pattern at St. Fintain’s Well about 40 years ago. — 0′ Donovan who wrote the above about 1837. This is a holy well in a place called Queensland, parish of Street. Stations are performed at it on the first Sunday of harvest. Of the Saint’s Church no trace now remains. It is traditionally told that the Saint is interred in a small mound, called on the Ordnance Survey Map Kinard (recte, Ceann-drd)* high head; which mound is to be seen on the bank of a rivulet to the east of Lismacaffrey. The Saint’s holy well was much neglected till the late Mr. Con Fagan, of Lismacaffrey, erected a cross and pailing around it, and left beside it an At), for drinking its pure water. * ” There was a nunnery called ‘ Kenard,’ on the lands of Clonmore, parish of Street.” — O’Donovan. In Rathowen there are two civil parishes. In Rathowen (Russagh) Civil Parish there are 9 townlands plus 26 in Rathowen (Rathaspick) Civil Parish. 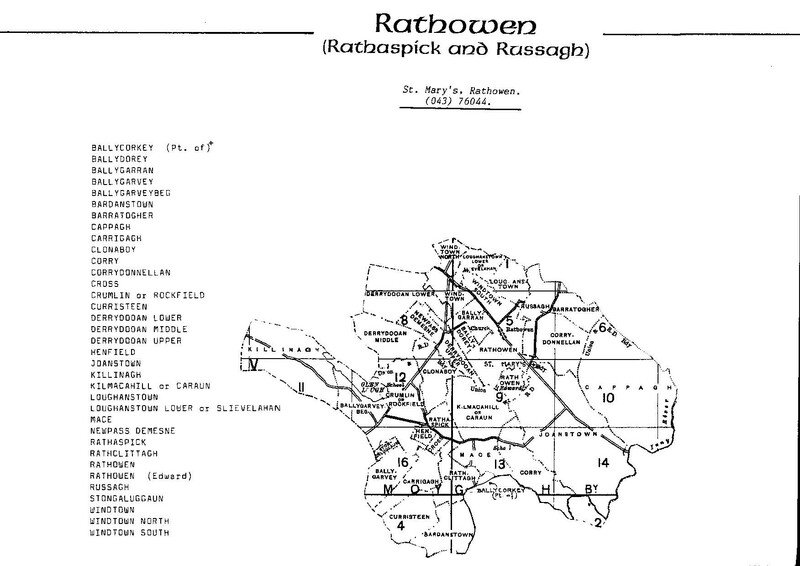 St. Mary’s Rathowen Roman Catholic Parish includes all 35 townlands. grave without uttering a foolish laugh." -- Kuno Meyer. the eight distinguished scholars of Armagh, about the year 740. St. Coemain Brec, Abbot of Roseach, died 14th September, 615 A.D.
anglicisation of Each-inis (Four Masters), horse island.